"A journey through understanding and fellowship." 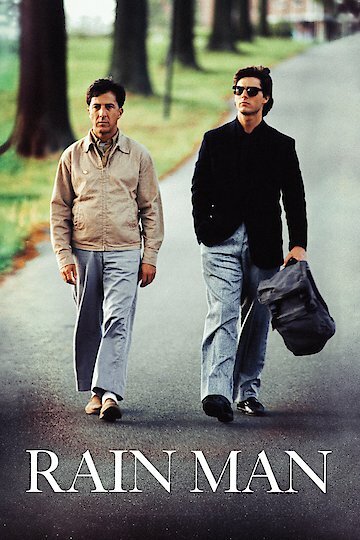 “Rain Man” is a classic dramatic film that was critically acclaimed for its quality acting, directing and screenplay. The film was honored with the Academy Award for “Best Picture”. Barry Levinson won for “Best Director” and Dustin Hoffman earned the “Best Actor in a Lead Role”. The film also won the Oscar for “Best Original Screenplay”. In addition to Hoffman, the movie co-stars Tom Cruise. Cruise plays Charlie Babbitt. He is a self involved yuppie who deals in luxury vehicles in Los Angeles. He is in the middle of a deal that would deliver several luxury foreign cars to several high profile buyers. The deal is being held up by the government and the bills are becoming due. Charlie gets a call informing him that his father, Sanford Babbitt, has passed away. Charlie has had a fractured relationship with his father for some time and was not on speaking terms at the time of his death. He heads to Ohio in order to settle the estate and receive his inheritance. Charlie is angered when he is told that an unknown person has been awarded chief recipient of the estate and Charlie is left with only a set of rose bushes his father’s classic Buick Roadmaster convertible. Charlie takes some paperwork and tracks the beneficiary down and learns that the funds are being provided to a mental institution where Raymond Babbitt lives. Charlie learns that he has a brother that he never knew about. Raymond has a form of autism and is considered a savant. He has remarkable recall and mathematic skills but is unable to function in a normal society. He has a strict routine that he needs to follow in order to stay calm. Charlie is incensed that he was never told that he had a brother and sneaks Raymond out of the hospital to return to Los Angeles so that he can have his lawyer investigate the legality of his father’s will. The two set out on a memorable adventure across the country. Charlie learns more and more about Raymond and his childhood. He has vague memories of a friendly voice that sang him to sleep and learns that those memories were of Raymond. He discovers how Raymond came to be hospitalized and realizes that he has a strong internal bond with Raymond. The film ends with a very heart touching reunion of family. Rain Man is currently available to watch and stream, download, buy on demand at Starz, Amazon, Vudu, Google Play, FandangoNow, iTunes, YouTube VOD online.